Looking back, Gilly almost ruined things, just as it all began. The impeccable touch, leaping headers and sharp finishing – even as a teenager I knew this was class. Trouble was, unconsciously I compared everything that followed with this benchmark, little realising that what I took as a wide-eyed youth to be the norm was in reality the gold standard, never to be surpassed. It took many years and a great deal of heartache before the penny dropped. Even in his prime, Alan Gilzean did not look like a professional athlete, let alone one of the finest strikers the club has ever seen. Thinning hair slicked back and a shambling, slightly stooping gait made him look older than he was. He didn’t so much run as ambled, for all the world suffering from the hangover that surely must follow his legendary appetite for alcohol. Yet appearances can be deceptive because Gilzean is the very epitome of the modern centre forward, a man who scored goals and made them too. He had no pace to speak of but the mind was keen and clear. In the hurly burly of a frantic penalty area, the greatest remain calm and still. Let the others move, then the space is revealed. Gilly would be there, pouncing on a loose ball or touching home a cross. Sometimes he would wait, then move a fraction ahead of the rest. Possibly others had tried the near post glancing header before but if so I don’t remember and anyway, Gilzean perfected the art. Other more orthodox crosses, he leapt, soaring from a standing start, so sure and certain was the contact that I swear I heard the smack of leather on bald pate above the celebrations of the crowd. All truly great players possess a distinctive move, unique and unforgettable that marks them out as extraordinary. For Gilly it was the glancing header. Long ball or cross, he would step in front of the defender then rise to meet the ball, sometimes body tall and taut, at others contorted in effort but with the sole aim of head to ball for the perfect touch. If Chivers was stampeding through or Greaves loitering with intent, it arced precisely into their grateful stride. The accuracy was astonishing and there is nothing like it in contemporary football. If as an admirer states he was “Nijinsky in studs”, then Crouch is a three legged carthorse on his way to the glue factory. On the cover is an iconic image. Gilly leans laconically against a post, legs crossed, maybe a slight smile playing on his lips. The area must be bulging with bodies but he’s alone, a master of his own time and space. Don’t be fooled – in the mud on shorts and legs lies evidence of sweat and labour. My own favourite photo came from an early 70s programme. Jennings saves his second penalty in the game at Anfield. As Beal and Knowles rush in to congratulate him, Gilly is already wheeling away with not a flicker of emotion on his face. It happened, now let’s get on with it. He was an easy man to underestimate, but try telling that to the defenders who faced him. Many give testimony to his prowess in the book. He seldom blew his own trumpet, preferring to slide away after training, usually to the pub. Hunter Davies in the Glory Game concluded that he saw football as a job and that he didn’t like the game, but that was mistaken. He loved playing but could leave it behind at the club gates. Part biography, part detective story, James Morgan’s excellent book is propelled by his quest to solve the mystery of why so little is known or remembered about a footballer who was prodigiously successful on both sides of the border. 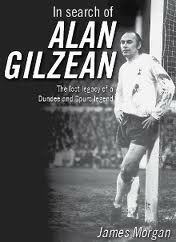 A lifelong Spurs fan, he involves the reader not only in his search for the great man, rumoured to be a destitute recluse, but also in his dogged pursuit to right a profound wrong and secure a place for Gilzean in the Scottish Hall of Fame. Gilzean was born and brought up in Coupar Angus, a small Scottish town. A natural sportsman, he played with distinction for Dundee, for whom he totalled 113 goals in 134 appearances. When the time came to leave, Bill Nicholson’s Tottenham was always his preferred destination and he turned down several more lucrative offers, including one from Italy. Much was made at the time of his disloyalty in letting Dundee down. However, he made his move only after careful deliberation and at the age of 26, hardly a money grabbing tyro. A great favourite of Billy Nick’s, he completed 10 years with Spurs, during which time he adapted his game to create two superlative partnerships with Greaves and then Chivers, no mean achievement as their styles could not have been more different. In the process, he selflessly put aside his own glory for the sake of the team, converting from an out and out striker into the perfect partner. Gilzean’s apparent indifference on the field hid a fierce competitor who worked hard at his game. What emerges most from the many entertaining stories told by those who knew him and played alongside him was how well he was both liked and respected. His taciturn appearance belied a man with a playful sense of humour. His team mates revered his awareness and touch: he brought out the best in them, and they are grateful. When I interviewed Greaves recently, without hesitation he named Gilly as the greatest he played with. Morgan is a fine storyteller, weaving his tale with the same dexterity as his subject demonstrated on the pitch. With thorough research and the copious use of anecdotes, he allows the reader to build up a detailed insight into the character of a man who hid from the limelight. Like any good mystery writer, he maintains the air of anticipation to the end and I found myself rapidly turning pages as the denouement of a possible face to face meeting approaches. Along the way, there’s plenty of entertainment as he reels out stories from a bygone age of football. Gilly was a fearsome drinker with an eye for the ladies, and used to frequent the Bell and Hare with Mackay, Jones and others, chatting to the fans while Bill Nick turned a blind eye. It’s a different world, with home being an average semi in Enfield, outrage from Dundee when in the mid sixties he demanded an increase on his weekly wage of £25 (John White was on £85, after all…), reporters nicknamed ‘Scoop’ and, most tellingly in this age of the celebrity footballer, a move to London would mean greater anonymity, compared with small town life. A passionate fan, Morgan need agonise no more that his subject has not received due credit for his achievements as his highly readable account has set the record straight. Not only an antidote to every ghostwritten, mind-numbing footballer biography that you have ever read, it’s a fitting tribute to a truly wonderful Tottenham Hotspur player. As a kid, I didn’t know much about football and even less about life but I knew one thing about Gilly, the King of White Hart Lane: he had style, and when I watch our team, I search for it still and let me tell you, it’s hard to find. The very best thing about this book is that if you never had the privilege of watching him play, you’ll understand. Just reading this now, but I already share the view that even though I didn’t see him play, I almost think I did – very well written, and puts many, many other books to shame. He lives in my home town. Not much else happens here so that’s something to crow about. You and Gilly. Virtually related. Lovely writing yet again, Al. Have just finished the book today. I first started going over there in ’71 and Gillie was one of my heroes. This is a fine book that holds the attention of the reader all the way through to the end. Under normal circumstances this would be a tribute to the writer but when you bear in mind he only ever met the subject on two occasions it is remarkable. Or perhaps therein lies the paradox. Perhaps the reason the book works so well is because Alan Gilzean is such an unusual bloke and has remained so elusive all these years. Anyway, a great book about a great player. Essential reading. When we went to WHL in his day you went knowing Gilzean and/or Greaves would score. If you never saw Gilzean think of Berbatov’s close control,more subtle heading than you’ve ever seen and Tony Adam’s thirst! All this was in a day when defenders like Jackie Charlton and Tommy Smith were allowed to tackle almost any way they liked. With those defences in days when your own fans offered contempt if you dived Gilzean offered great class subtlety and amazing intuition as to where Jimmy Greaves needed the knock down. I sometimes regret that we don’t have the heavier ball that rewarded players who offer more than tippy tappy passing and sprinting. I’d love to see how Fernando Torres would have coped with the defenders whom Gilly could outmuscle and outwit. Strength wasn’t obviously the major part of his game but don’t be under any illusion, you didn’t last 90 minutes back then by being a a wuss and waving at the Ref for a yellow card. With only one Substitute and a squad of maybe 16 you turned out and fought for the shirt and that’s why Gilly deserved every second back in the limelight. Top top man!